Enjoy your vacation at this expansive beautifully furnished updated home with private pool, dock and more. Located minutes outside of historic St. Michaels, MD. Mallard's Landing is newly owned and refurbished. What we love about this property is the open feel and the fabulous interior water views. You can't build homes this close to the shoreline anymore. 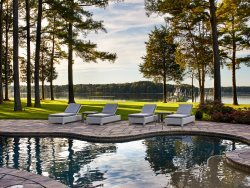 The double sided fireplace is a wonderful addition for the shoulder and off-seasons and the waterside pool is perfect for summer lounging. Equipped with kayaks and an outdoor billiards room, Mallards Landing is simply fun for friends and family. Dock Information: Miles River 40' dock, 3'MLW - Please note there is a sandbar at the mouth of the creek. Larger boats will have a difficult time at low tide. Water Toys Included: One (1) Double Kayak and two (2) Single Kayaks Provided. To ensure proper sizing for your group, please bring your own life jackets, or we can recommend a rental agency. WiFi: Please note that the rural nature of the area limits the data access and some properties can experience slow speeds, or access limited to e-mail and web browsing and not streaming. Pet Policy: This property is dog friendly for up to two dogs at no additional charge. All ESVR properties include bed and bath linens, beds made prior to your arrival, and a starter supply of toilet paper, bathroom soap, paper towels, and dishwater detergent. Please be sure to add these items to your grocery list for the duration of your stay. Very pleasant vacation home and the proximity to St. Michaels and historic Easton was another great feature. We would love to return again! Customer service is great and properties are top-notch. LOVED Mallards Landing. It's exactly the kind of home we're looking to buy in this area. It was so comfortable, well-decorated, and had exquisite water views/access. Perfect. VERY clean. SPOTLESS. The views and the serenity of the spot on the water, the property and the entire neighborhood. Mallard's Landing is a beautiful home and waterfront property We chose the house for the waterfront views and the homes amenities - but the mature trees and landscaping made the property extra special (Humming birds visited the flowers off the sunroom each day) We had a wonderful vacation 7 Adults and one very happy dog Our adult children enjoyed using the kayaks and pool table/game shed We all enjoyed the pool The kitchen was well appointed The living and dining rooms were the perfect size for everyone to be together Lovely water views from indoors Dock was great for fishing and crabbing Very close to shops and restaurants in ST Mikes Perfect family vacation We look forward to vacationing at Mallard's Landing next summer! No issues whatsoever. The checkin and checkout was excellent. Our first family trip to Saint Michaels was enjoyable. Our family felt right at home the moment we arrived. The home had everything we needed and more. We were very satisfied with the property. If you have a boat, make sure you study the charts hanging on the fridge. I tried to bring my boat and hit a sand bar. Lots of jelly fish in the river. One employee who answered the phone was tentative, couldn't help with reservations, and seemed not to leave a message for Jessica, who ultimately helped us. Jessica was polite and efficient. The early check in and late check out were appreciated (though we wound up not using the late check out). MANAGER RESPONSE: Thank you for your feedback. As it is early in the season, we do have some new staff members in the process of being trained. We apologize for any inconvenience while they are getting up to speed. We loved this house! The views are great. The kitchen is really well appointed. The kayaks are nice. The kids loved them. And our Golden loved the bay. The road forms a mile loop around the house which is great for running. The community is quiet. And St Michael's is very close. Great trip! The unexpected amount of lawn mower noise on surrounding properties was disturbing perhaps because the properties were closer together than we anticipated. MANAGER RESPONSE: Thank you for your comments and we are glad to see you had a good time. We have had a very unusual amount of rain this Spring and unfortunately lawn services had very short windows in which to cut the grass. Typically the services are staggered and less intrusive. Mallard's Landing is located in a neighborhood with most properties on two acres, but the water does carry sounds. very responsive and friendly staff! We had the best time at Mallard's Landing! The house was well-equipped with great games, nice furniture and a stocked kitchen! We loved it and will be back next year!